Portable, affordable, collapsible and expandable—the trade show banner stands available from E&E Exhibit Solutions can be used on a table, in a larger booth, in a lobby, at a convention, an outdoor event and more. 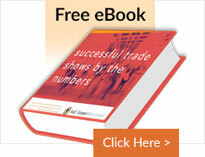 One of the most versatile trade show booth enhancements, the banner stand is a must for any event. Lightweight – each unit weighs about 10 lbs. 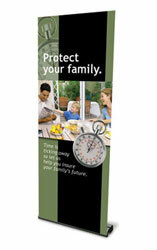 Our retractable banner stands have graphic panels that unwind from a mechanism in the base. Simply pull up banners like a projector screen. Retractable banner stand units with interchangeable cassettes also allow you to change your graphic message quickly in the field. No need to send back to production for installation! Our DUO Sprint banner stands have separate graphics that clip to the top or bottom—or anywhere in between—of the telescoping pole. Pole stand units are very versatile; print multiple banner graphics for your different events and markets and choose the message that best fits your audience when you need it. E&E Exhibit Solutions can create a custom graphic for your banner stand or produce graphic banners from the digital art files you provide. Our full-color digital graphic banners are produced with high-quality paper (which resist tearing and curling), protective laminates and vibrant inks. Have a question about the right banner stands for your needs?